Be the envy of your gaming table with this awesome tabletop accessory! Includes dice tower, 2 DM screens, and dry-erase magnetic turn trackers. Never have your dice accidentally roll all over the table or drop on the floor. Easily keep track of your maps, notes, and player's turns! Dice Tower is over 12" tall with four ramps for optimal randomization. 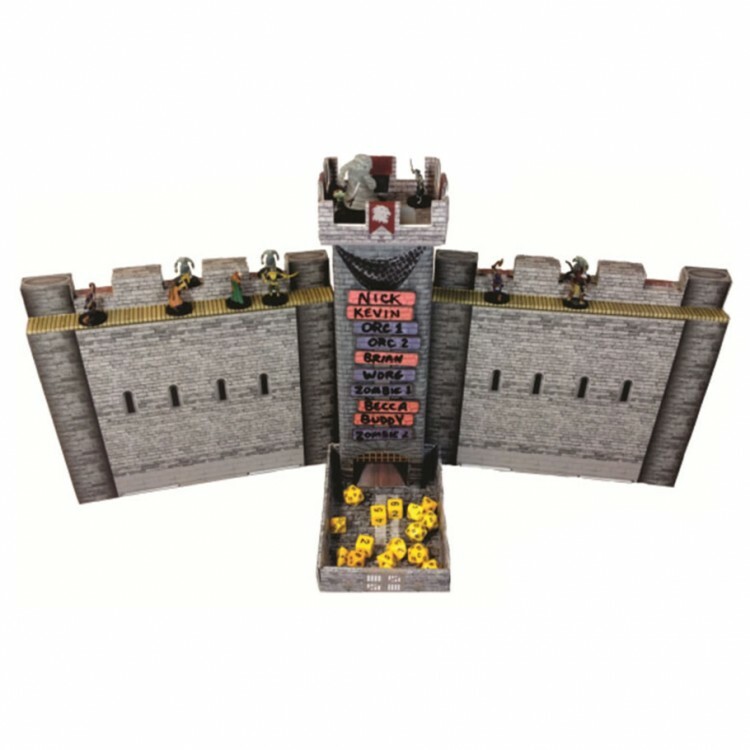 Two Castle Wall DM screens for attaching maps and rules with the included magnetic labels. Each wall has a slot to hold pencils during the game and can hold 2-3 RPG books after the game. 5" x 7" dice tray easily holds 20 dice or more. Magnetic dry-erase name labels for tracking initiative and turns of both players and monsters. Initiative Tracker can be attached to any of the sides of the tower or walls for viewing by either Dungeon Master or Players. The walls and tower are made of corrugated fiberboard so it is light weight, but will not chip or crack like plastic dice towers. Corrugated fiberboard material provides pleasant rolling sound. Many design revisions since first edition to address customer feedback. Dice tower inner ramps now lock in place and the tower fits snugly over the tray. Side flaps of castle walls fit into slots of tower to integrate together.